I mean, seriously. Have you guys ever seen a measuring tape, a level or a square? Is it really that hard to ensure that cabinets hung next to each other are at the same height? Is it too much to ask that a piece of drywall not bow inwards at odd angles? Is it just too much of a hassle to actually use the ground wire for grounding electrical outlets? Is tiling a wall properly too much to ask for? None of the outlets in the kitchen were GFCI. That means you could easily kill yourself by spilling some water on the backsplash. The disposal was wired directly into the current with only a switch sitting between it and the line. Want to work on the disposal? Go turn off the breaker instead of unplugging the thing. The disposal switch used a separate box about 3 inches away from an existing box with outlets. You know, instead of just swapping out for a double box that looks much nicer. The cabinet on the right side of the stove is a full half inch higher than the cabinet on the left side of the stove. I think we’re going to have to pull out the cabinet, trim it to height and then put it back. The pipes for the kitchen sink had no shutoff valves. Want to work on the sink? Shut off water to the entire house. When those same pipes are leaking, fix it instead of allowing it to drip. That results in rotting out the bottom of the cabinet, a piece that was pretty easy for us to remove put is proving much more difficult to replace. 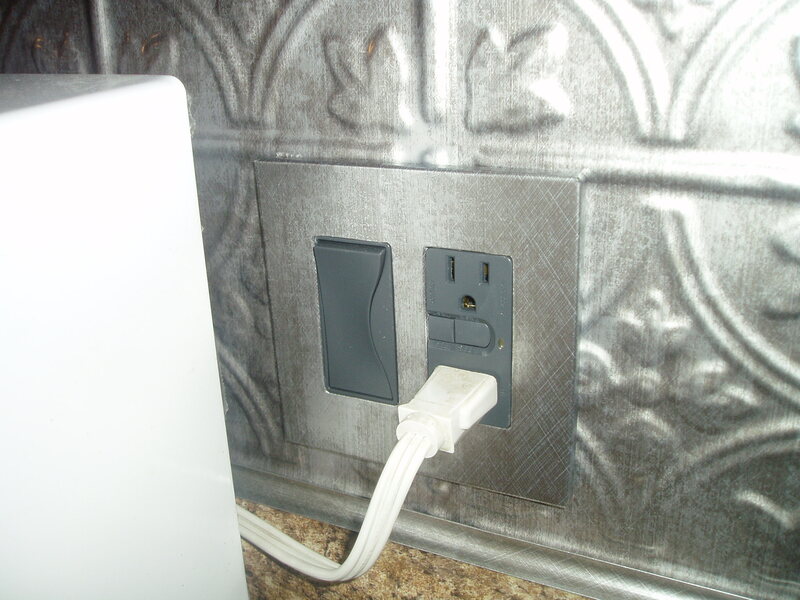 As as a special sneak peak part 2, here’s what the new outlets on the counter look like. Note the faceplate with no visible screws. Rawr. Aw the joy of home ownership… I’ve heard that about White city… one of the reasons I was glad I bought in Sandy. Everytime I walk into my downstairs bathroom I pause to think how insane the homeowner must have been to design it this way. Ugh! good luck! And I thought I read something where you guys said you weren’t handy enough to do it yourself. It’s not so bad, is it! I forgot the “Good job” and the subsequent pat on the back. Jesse this is not a white City problem but a problem in General. With every new house you buy, (the chances are you’ll buy a few) you will get older and wiser, but unfortuanately there is always something new not anticapated. In our current house the builder(a certified idiot) used old barnwood. I’m not talking about for looks, but structural. He also used light weight joices in the floors, which were compensated by having many load barring walls on the 1st floor. Some of the joices warped causing us to have to take up the floor so our sliding glass door would continue to work. The Short joices(load bearing walls) also made it impossible to expand the size of the rooms Oh and then there was the floor tile put over plywood instead of wonderboard which then of course needed to be grouted every other week.